The catchword now for Kottayam-based Resh Susan, a blogger and instagramer, is ‘oddly satisfying’. 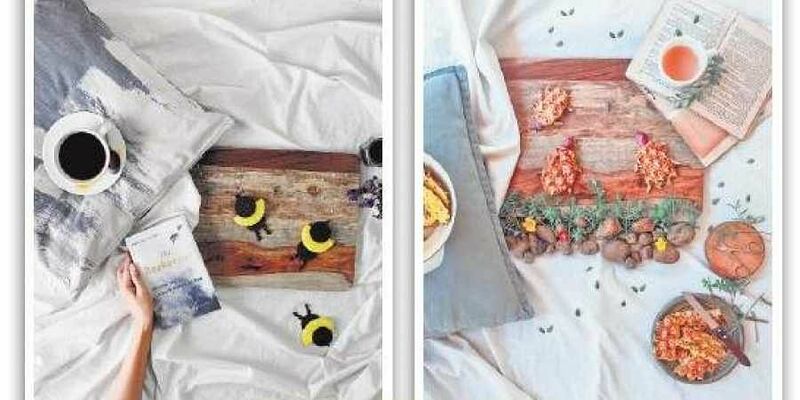 KOCHI: The catchword now for Kottayam-based Resh Susan, a blogger and instagramer, is ‘oddly satisfying’. It is this phrase with a hashtag which brought her a wider recognition on the photo blogging website Instagram. For the uninitiated, the website hosts a hashtag contest with different themes every week, the best entries are chosen and featured on its official account. A few weeks ago, the challenge was to post videos or photographs which oddly satisfy you, this got Resh thinking and the wafting smell of garlic being sautéed in butter and boiling milk filled her imagination. It took her down memory lane to her love for candy, so she got creative and made the Instagram logo on a dish with good old Gems, poured in some milk and caught it smudge slowly in a time lapse. It was posted and forgotten. Recently when Instagram turned eight years old, they unearthed this memory from the archives. The views on Resh’s Instagram handle ‘thebooksatchel’ skyrocketed to 34 lakhs in less than a day. And she was on cloud nine for her work did find recognition.Before she turned to blogging, Resh, a postgraduate in aerospace and electrical engineering, struggled with her taxing work hours and looked out to pursue a hobby to break the monotony. Her love for cooking made her want to document the variety of dishes she whipped up, but the time constraint put it on a back burner. She reached a point where she felt she needed to do something that made her happy. “I have always enjoyed reading, so the idea of a book blog started taking shape and ‘thebooksatchel’ was born. However I felt I had to level up and give a visual appeal to my blog,” she says. This led her to dabble in photography. A self-taught photographer, she slowly discovered the amazing window thrown open by Instagram. Her book photos with pretty props and design and crisp storytelling became an instant hit. She was soon reviewing and photographing a number of books and running book giveaways in tie-ups with prominent publishers. Her photography skills also came in handy; she was approached by many companies to do their product photography. However, she says her first love will always remain everything to do with food. “Food photography is tough because the secret in its success lies in its ability to appeal to a viewer. The props, lighting and angle have to be on the dot. I hope to become a good food photographer sometime down the lane,” she signs off with a smile.